The Parades Commission adjudication body has rejected two separate proposals for the march on each of the next two Saturdays. Two weeks ago, on the ‘Twelfth’, intense rioting broke out when Orangemen and loyalist supporters were prevented from marching through a series of Catholic estates in north Belfast on a ‘return’ march from an Orange rally. That was followed by a further five nights of riots across Belfast, when police fired over fifty plastic bullets as loyalist rioters who threw blast bombs, petrol bombs and erected burning barricades. The violence was being increasingly orchestrated by the unionist paramilitary UVF before finally dying out on the sixth night. With more protests expected this weekend, Orangemen are being urged by both the Dublin and London governments to “reconsider”. “I think that the Orange Order need to reflect carefully on whether they should persist in calling for these parades to take place every Saturday,” said British Direct Ruler Theresa Villiers. Orangemen have vowed to keep applying for permission to march the route until they are successful, insisting the original ‘outward’ parade will not be deemed to be finished until the route is complete. Their strategy has been compared to their actions at Drumcree in Portadown, where weekly protest parades continued for years following a decision to reroute a ‘return’ sectarian parade away from the nationalist Garvaghy Road. 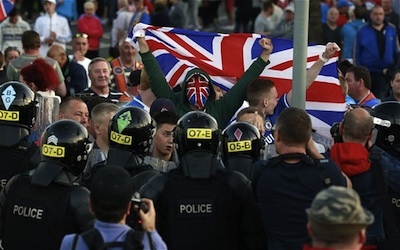 While loyalist violence and disturbances over that ruling made international headlines in the late 90s, the controversy has gradually declined and in recent years has disappeared entirely. Sinn Fein representative for North Belfast Gerry Kelly called on the Orange Order to “show leadership”, and stated that the way to resolve contentious marching issues is by getting to the table and holding discussions with local residents. He said the actions of the Orangemen in applying for three more contentious marches past Ardoyne, Mountainview and the Dales is “not the action of a body seeking diffuse the situation”. He pointed to planned talks involving US envoy Richard Haass which are due to begin in September. He said that there should be no escalation of the situation before these talks. “The irony of these marches is that by calling for them the Orange Order are actually defeating their own argument. “The Orange Order argue that three lodges cannot get home on the 12th of July yet on a weekly basis they intend to hold a protest march in Woodvale where people can go to and come from with no difficulties. SDLP North Belfast representative Alban Maginness described the series of weekend protests as “brinkmanship”. In a refence to last Saturday’s march, he said: “The Orange Order has made its point and demonstrated that they can do things peacefully while attracting significant support but there is no need to keep repeating it,” he said.